An acquaintance who lives one street over posted this notice on Facebook last month: “Neighbors: We have a few hundred pounds of organic, free-range, native, sustainably pollinated Concord grapes fixing to fall off the vines and make a righteous mess. Want?” My answer was, more or less, “I’ll be right over!” First, I have a hard time turning down fresh, free food growing in someone’s yard. Secondly, I’d long thought bunches of wild, deep indigo Concord grapes would be a fantastic photo subject. Thirdly, I seem to have a masochistic desire to complete recipes that involve ridiculously time-consuming, tedious steps, but that result in a very satisfying or unusual end product. So, yes, I basically spent the better part of two days picking and then photographing grapes in various stages of undress, making the jam, and then shooting the pretty purple spread. Hannah was not kidding when she said they had a few hundred pounds of grapes. The smell immediately hit me when I arrived in her driveway. It was so intense it almost seemed artificial, like grape Kool-Aid scent wafting through the air. The vines stretch from her garage all the way down a fence that extends at least 50 feet along the length of her backyard. When you’re surrounded by these plump, purple orbs, it’s hard not to pop one in your mouth, so, of course, I did. Hannah, knowing what I was in for, waited for my reaction with a bemused smile. The tartness immediately made my lips pucker and my eyes grow wide. Wow! That is some seriously intense grape flavor. 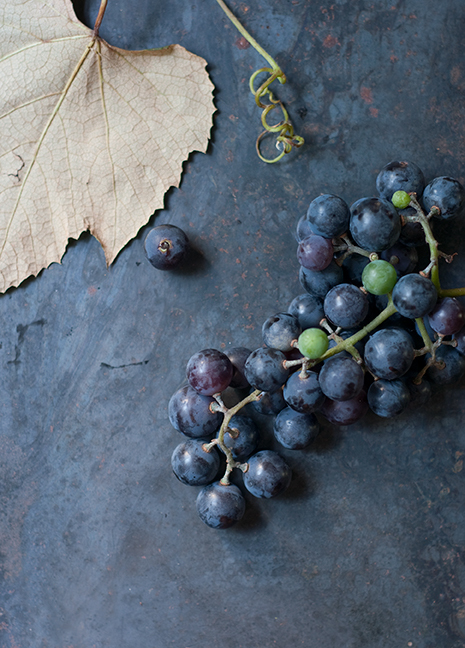 I spent a couple hours arranging and shooting grape clusters and vines in numerous set ups on a metal background, and then began the process of skinning the grapes. 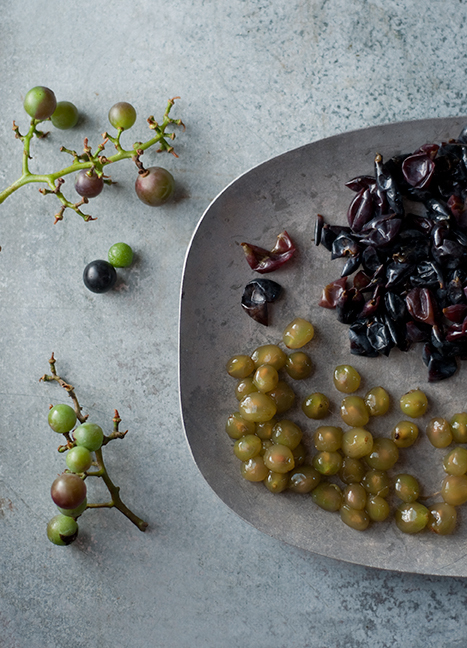 This isn’t as hard as it sounds, but it does take a while…especially when you’re skinning 5 pounds of grapes! When they’re ripe, you can just squeeze one end of the fruit between your thumb and forefinger, and it pops right out of its protective coating. The skins and naked fruit were so cool looking that another round of photos ensued. Eventually, I got back to the jam making itself. I used this recipe, though as is my standard practice when making jam, put in half the amount of sugar the recipe calls for. And for a second batch, I used honey instead of sugar, and I much prefer how that tastes. The jam thickened nicely without pectin after about 45 minutes of simmering. 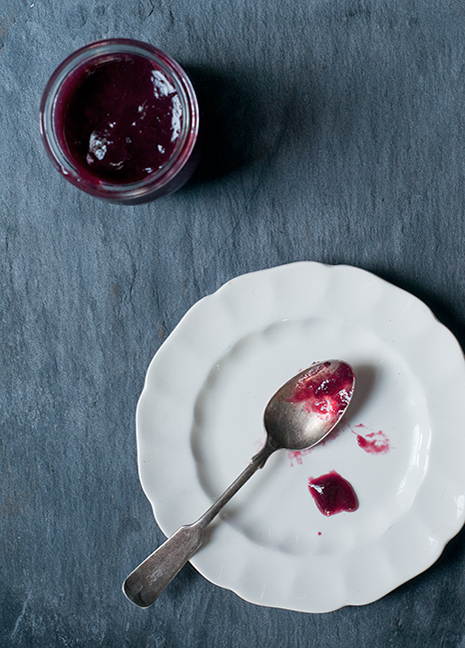 The grape flavor is still incredibly intense in jam form, so one does not need much to satisfy the desire for a hint of sweet, tart fruit flavor. A dollop on top of goat cheese on a cracker or a thin schmear on some whole grain toast is about all you need. 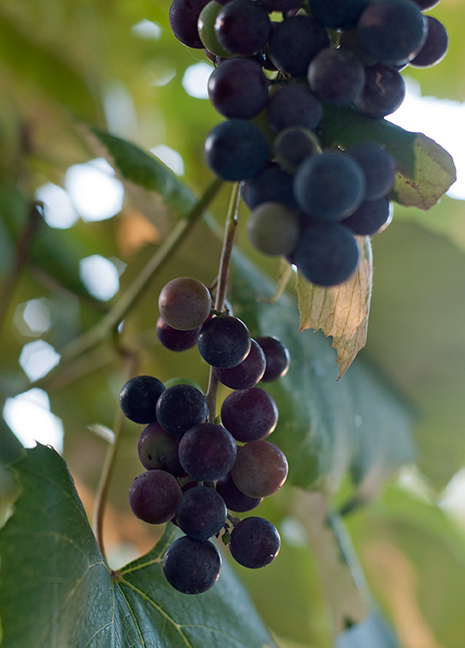 If a friend or neighbor has a surplus of these blue-black beauties, or you see them growing on the side of the road, I recommend you run right over and get yourself some antioxidant-rich grape goodness. If a labor-intensive jam isn’t in the cards, try making something simple like juice that could be added to seltzer to make a refreshing homemade grape soda. This entry was posted in cooking, food and tagged Concord grapes, grape soda, jam, Maine food photography on October 16, 2012 by Stacey Cramp. Great post! I was just talking to my husband about wanting to make jam on my own…my son loves it and I want it to be fresh and healthy for him! Great post. Nothing beats concord grapes for taste. Great!